Amla - Supplies antioxidants for detoxification. Indian Madder - Supports blood purification and facilitates blood circulation by removing congestion and improving blood quality through enhanced hemoglobin production. Licorice - Promotes healthy liver function, contains anti-ulcer and anti-microbial activities. Yashtimadhu contains glycyrrhetinic acid and glycyrrhizin carbenoxolone which have anti-inflammatory and antioxidant properties that contribute favorably to hepato-protective effects on the body (protecting the liver). Andrographis - Promotes healthy inflammation response. Cabbage Rose - Maintains normal hormonal balance. Chebulic Myrobalan - Supports healthy digestion and purifies blood. Chicory - Supports liver and gallbladder functions, and digestive tract which are vital organs for detoxification. Gotu Kola - Nurtures healthy cell rejuvenation and stimulates the brain to regulate detoxification process. Indian Jalap - Sustains healthy immune system response and treats gastrointestinal tract infections and respiratory system. Neem - Promotes healthy liver function, lowers blood sugar, reduces blood pressure and heart rate. 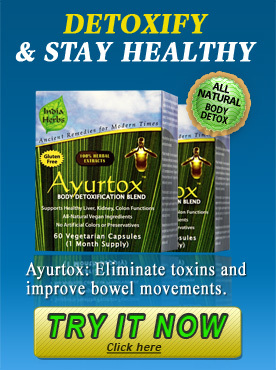 Phyllanthus Amarus - Supports healthy digestion and improves liver function. Tribulus - Supports healthy kidney function, urinary tract, and reproductive organs. Turmeric - Supplies antioxidants for detoxification. Picrorhiza - Sustains healthy immune system response by working directly on the entire body with positive impact on toxin elimination, general health, and longevity. Put these powerful extracts to work for you -- try Ayurtox today!